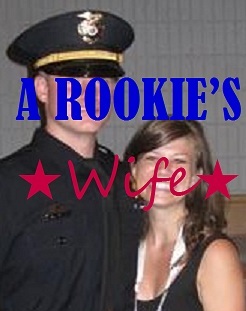 A day in the life of the wife of a Police Officer isn’t probably what you think. For starters, my husband and I work different hours. I’m on your typical work schedule and he works a shift. When my work day is over, I can leave what I’m working on and pick it back up tomorrow. It would be hard for him to say to a victim, “sorry but my shift is over – I’ll come back tomorrow and we can finish talking about your report (read: burglary, mugging, etc).” Understandably, people wouldn’t appreciate that. So he works until he’s done. And honorably, he puts the same effort into the first report of the night as the last report of the night. He doesn’t let his work slack just because he’s working overtime. Because of his crazy work schedule, I sleep alone most nights. Husband gets home and immediately has to shower – he works (by choice) in the worst area of our city. The things that his uniform, his gadgets and he, himself, touch and are exposed to need to be washed off as soon as possible. And, like most normal human beings, he doesn’t come straight home from work and go to bed. He has to unwind. He’s had a stressful day – probably a lot of people yelling rude things at him, people being unappreciative, and a lot of chasing and tracking bad guys. By the time he’s crawling into bed, I’m crawling out to get ready for my day. That leaves us only a few days to spend together – and that’s only if he’s not subpoenaed to a case. Since he’s a rookie officer, those two days are not days that I have off, we don’t get the luxury of weekends together. We try and make the most of the time we have together. Enjoy a dinner, watch a movie, try to see our families together – but, it’s never enough. In any given week, I hardly get to see my husband. And you’re right in your thinking – I signed up for this. However, I didn’t sign up for all of it. I proudly say I am the wife of a cop. My husband sacrifices his life day in and day out for his city. And the people are few and far between who appreciate it. And this is why I think it’s hard being a police officer’s wife. Imagine waking up and not knowing why your husband is coming home late and being fearful of turning on the news – who knows what you might find? Then, going anywhere the next day and hear people talk about the police and how they could have done a better job – talk about the police like they’re not people and they don’t have families. Every movement my husband makes is criticized by the public, sensationalized by the media and scrutinized by the citizens. Luckily, for the city, husband is calloused to it. He doesn’t let it affect his work performance in the slightest. A wife (SCW Stella) who says it better (and is a bigger person) than me once wrote a post about a police officer being caught doing some dreadful things. The public took the chance to jump all over this and make some awful, general comments. To them, it defines the entire police force – they don’t see it as one bad apple in the bunch. (If anyone works in a profession that doesn’t have a bad apple, please sign me up. Let’s be honest in that the only difference is that your profession isn’t under a microscope.) She goes on to say that if something awful happens to you – you’re going to call on that police force that you sit there and make fun of and you’re going to rely on them. And guess what? They’re going to do their best to help you out. (And my favorite thing that she says…) I HOPE YOU BLUSH when that happens. So, I hope you blush. For those of you who disagree with my post, I apologize. I’ll try and validate some of statements. Lots of people bond over the degrading of officers. It’s a great common ground. We’ve all been pulled over for “outrageous” reasons and love to dish about them. When my husband was in the academy, he watched video after video of unlikely suspects shooting officers – including a grandmother, a dad with kids in tote, etc. He has to approach each and every vehicle as if you are going to shoot him. And I expect him to do that so that he can safely come home to me every night. So, I’m sorry if he doesn’t know you’re the homeroom mom, or the soccer coach – to him, you’re a stranger who was breaking the law. Yes, breaking the law. Regardless of if it was “chump change”, or whatever else. Let’s admit that you were, in fact, breaking the law. In my profession, any “chump change” or smudge I make comes with some jail time. Here’s a fun fact – officers catch criminals through traffic violations! So maybe my husband pulls over a car for rolling through a stop sign and it has a car full of criminals that have warrants and he can take to jail. Or maybe, he stops the car that has an innocent person (who is still breaking the law) in it. Maybe you’ll get a ticket (because, perhaps, that intersection has had a lot of accidents and enough people like to dish about officers that you will probably spread the word of mouth that some jack A wrote you a ticket for not stopping at the stop sign. And guess what? The people you tell, will probably tell your story and then maybe, just maybe, you guys will start actually stopping at the stop signs) or maybe you won’t get a ticket and you’ll just be annoyed part of your day was wasted. My husband will also be annoyed that part of his day was wasted pulling over someone who should have known to stop - he could have been out catching bad guys. Ever had the media do a story on you? The closest example I have is the time a story was done on the school my sister worked at – it was about a kid on the playground and some events that took place. She immediately called me after it had been covered and said “None of that was true – it was all taken out of context and blown out of proportion!” Welcome to every single story covered by the media – about police officers and not about police officers alike. And what do we, as the public, do? Eat every word of it and then post ignorant comments. Let’s add it up again – stacked against my husband: public, city, suspects, media…. For my husband: me. It’s not easy being the wife of a police officer – for almost every reason you can think of, but mainly, because my husband gets no respect. (A great friend of mine is married to a police officer. One time, he pulled someone over and the person spit in his face and said “Now you have AID's”). Every day, his life is in danger, and every day he works as hard as he can. And every day, I listen to people degrade him. Am I saying there aren’t exceptions to this rule? Of course not, just like with any profession there are. Do I think the story you’re about to tell me (one time, when I was pulled over…) is an exception? Probably not, and honestly, either way, I don’t want to hear about it. I love my husband and I love being his wife. Please, please take the time to thank an officer sometime. And please, please try to remember they are human beings like you and your family. Would you want someone talking about your husband the way you talk about mine? Thank you for this post! I'm new to your blog. My dear, sweet, boyfriend is a new LEO. We're doing the long distance thing, which coupled with his job, is definitely interesting. I look forward to reading more.